This is Team VIP's first performance in favorite skit round.you can see the performance is always a boring one man show by nelson-the so called comedian. and the contents are extremely non vegetarian vulgar - we can't see it with our family. nelson telling something and laugh himself. and the chief judge trying to laugh and encouraging others to laugh. personally I can't see any comedy in it. Always jagadheesh tells about family moral values;but in this case he forgot every moral values and words by himself. though the truth about points was like that, jagadeesh given the first price to team VIP. Director Baiju Melila and cheif judge jagadheesh never published the total number of SMS got for teams. they confidentially played a cheap play behind curtain. lacks of sms and millions of money of viewers wasted through this cheap play. 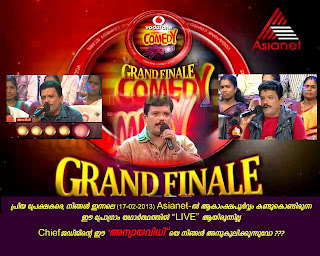 Ullas Panthalam Speaks About the cheating happend in vodafone comedy star grand finale. 16 തിയതി രാവിലെ 10:30ക്ക് ഷൂട്ടിംഗ് തുടങ്ങിയ ഗ്രാന്‍ഡ്‌ ഫൈനല്‍ ജയറാം അകെ കുടി ഒരേഒരു സ്കിറ്റ് മാത്രമേ കണ്ടിട്ടുള്ളൂ ..അതും ടീം രസികര്‍ അവതരിപ്പിച്ച സ്കിറ്റ് ...അതുകഴിഞ്ഞ് ജയറാം തിരിച്ചു പോയി...പക്ഷെ 17ാo തിയതി ലൈവ് ആയി കാണിച്ചതോ ..എല്ലാ സ്കിറ്റ് ഉം ജയറാം ഇരുന്നു സന്തോഷത്തോടെ പരിപാടി കാണുന്നതായി എഡിറ്റ്‌ ചെയ്യ്തു കാണിച്ചു..
ഇതൊന്നും വിശ്വസിക്കാന്‍ പറ്റുന്നില്ല അല്ലെ.... വോടോഫോണ്‍ 6 മാസം കഴിഞ്ഞപ്പോള്‍ തന്നെ sms സറ്റോപ്പ് ചെയ്തു എന്ന് അറിഞ്ഞതുത്തന്നെ ഞങ്ങള്‍ 16 തിയതിയാണ്. ഞങ്ങളെ വെച്ച് ജനങ്ങളില്‍ നിന്നും sms ചോതിച്ചു കോടികള്‍ ഉണ്ടാക്കി ഏഷ്യാനെറ്റും ജഗദീഷും ബൈജു മേലിലയും . sms അയച്ച നിങളുടെ കാശു നഷ്ട്ടപ്പെടുത്തുകയും ചെയ്യ്തു . 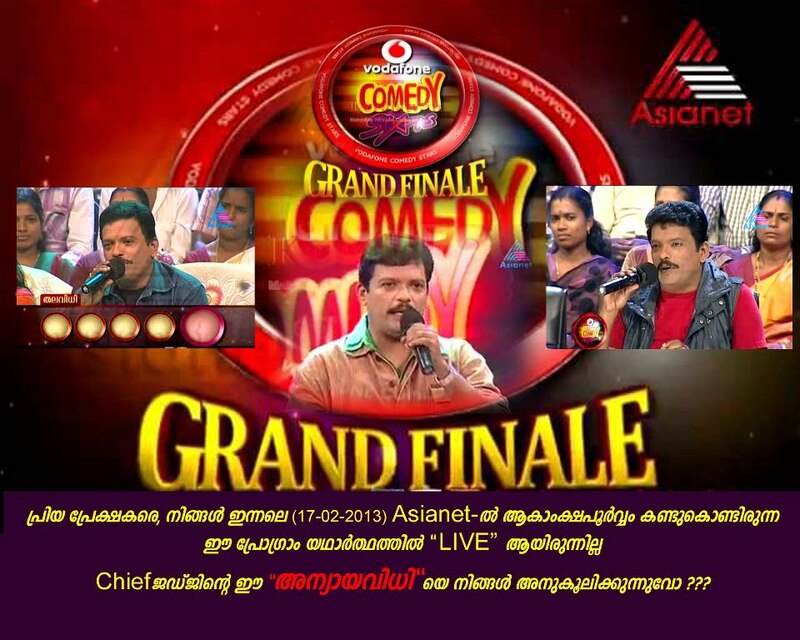 News About Vodafone Comedy Stars Finale Cheating..
A popular comedy show aired by a Malayalam television channel has landed in a controversy with the second prize winning team alleging ‘foul play’ in the selection of winners at the show’s grand finale held recently. 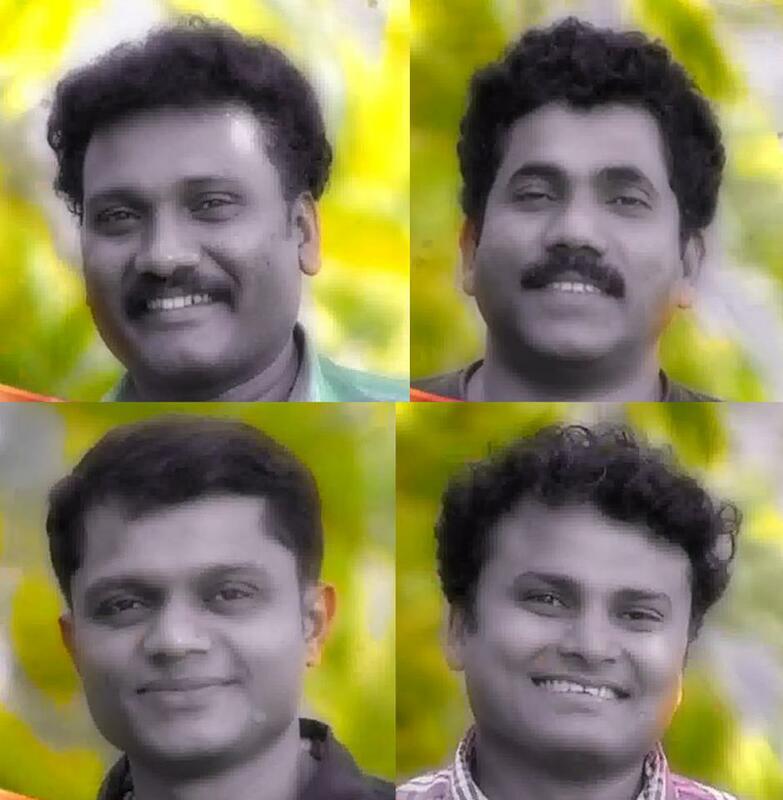 Members of team ‘Four Stars’, adjudged the second best team of ‘Vodafone Comedy Stars’ aired in Asianet channel, alleged that the show’s chief judge Jagadeesh and director Byju Melila ‘sabotaged the judging process’ and pushed them to the second spot despite winning the maximum number of SMS votes and maximum overall marks. “We got the maximum overall marks and SMS votes and came first in more than nine episodes while the team which was given the first prize was third in terms of overall marks. Also, they came first only in six episodes,” Four Stars’ team captain Ullas Pandalam told a news conference here. “In the grand finale, there were four judges. While three judges could award 20 marks each, the chief judge could give 40 marks. Despite our repeated requests, the chief judge and the director did not make the marks awarded by other judges public, clearly indicating foul play,” he said. Four Stars’ members said that they walked out of the show’s grand finale in protest but that portion was edited out of the show. “The show which was touted to be a live telecast was in fact a recorded one,” they said, adding that they found it more honourable to part with the second prize of Rs 4 lakh than silently suffer the injustice. “Over the last three years, many teams including ours cancelled many stage shows which was the source of our livelihood and suffered many hardships to participate in ‘Comedy Stars’. But we were paid a paltry amount of Rs 500 per show as travel allowance,” Ullas said. Ullas said that they decided to hold the news conference to make contestants of similar shows aware of the ‘backstage sabotage’ that might happen in the final selection of winners. They said that their aim was not to target a particular channel or individual but to highlight the plight of ‘hapless contestants’ who spent years for the success of various shows. really Team Four Stars deserves the first price in vodafone comedy star grand finale. In My Opinion Team Four Stars are the most creative, Talented and funny team in Vodafone comedy stars..
Members are Ullas Panthalam, Joby Pala, Ajith Koothattukulam,& Manoj vazhippadi. They really Deserves the victory..